Texas Attorney General Cracks Down on Election Fraud. Guess How Many People He's Prosecuted. Texas Attorney General Ken Paxton is cracking down on voter fraud ahead of the 2018 midterm elections. According to NPR, Paxton has prosecuted 33 people for 97 counts of voter fraud in 2018 alone. Between 2005 and 2017, the attorney general's office prosecuted 97 counts of voter fraud, which gives you an idea of how rampant the problem truly is and how committed Paxton is to stopping offenders. According to Beth Stevens, a staff attorney with the Texas Civil Rights Project, things in the Lone Star State haven't changed but prosecutions have. "The state of Texas is filing these charges at a more rapid rate," Stevens told NPR. "Not because the instances are increasing, but their prosecutorial discretion in filing is increasing." Paxton reminded people of his crackdown back in September, when an illegal alien admitted to voting. 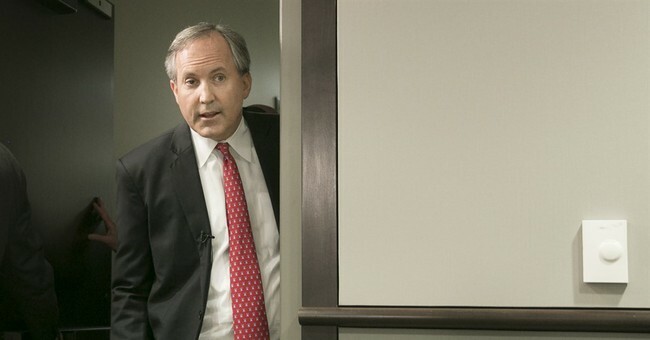 "Anyone attempting to deprive the people of Texas of their voice in either state or federal elections will be brought to justice and penalized by the full extent of the law," Paxton said. The issue of voter fraud has become polarized recently. Republicans have advocated for strict voter ID laws, which require a person to show their driver's license or ID card in order to vote. Democrats, however, say that this method of verification discriminates against those who can't afford a license or those who are in the country illegally. Those who are against Paxton's crackdown say it's an intimidation tactic to keep people from voting. One of the anecdotes they point to is the story of Crystal Mason. Mason was completing a five-year sentence for tax fraud when she was placed in a supervised release program after completing three years. In Texas, a person has to finish out their sentence before they're allowed to vote again. Mason wasn't aware of that when she went to vote in the 2016 presidential elections. When she went to vote she wasn't on the roster so poll workers gave her a provisional ballot. Once it was learned that she was ineligible to vote, her ballot was not counted. "Then the state makes a determination about whether they should be able to vote — and that's exactly what happened here," Tommy Buser Clancy, an attorney with the ACLU of Texas, told NPR. "And the system in that sense worked. It determined that Ms. Mason was not eligible to vote and her vote wasn't counted." Tarrant County District Attorney Sharen Wilson charged Mason with illegally voting because she believes Mason knew she was ineligible to vote. "She signed and affirmed a document which clearly stated that (1) she was prohibited from voting due to her status as a convicted felon still serving her term of supervision, and (2) she would be committing a second degree felony if she lied about her status," Wilson told KXAS-TV. Mason faces five additional years in prison for her vote. Clancy said Mason's story is a prime example of the types of cases Paxton is cracking down on. Stevens believes that the State of Texas is doing everything in their power to prosecute people of color and Mason is an example of that. The day that Mason was supposed to self-surrender, she decided to hold a voter registration drive. She didn't want her story to keep others from voting.